The CRP-10191 is a hard-edged miter door with angular profiles to give it a contemporary flair. 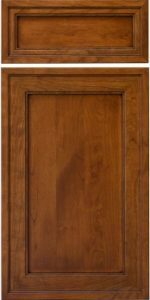 A very masculine looking door, The 10191 is a great choice for any area of the home. NOT AVAILABLE IN INSET CABINETS. Frame only OK. Mullions not available.